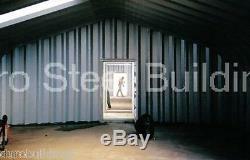 Duro Steel 30' Wide by 70' Long by 14' Tall Metal 4/12 Pitched Roof Building Kit DIY Garage Shop. Whether it's a back yard or commercial shop, a single or multi-car garage, shelter for the boat, RV or custom vehicle, a workshop or a place to store your equipment, the G-SERIES buildings are perfect protectors. For years, we have been the leader in the supplying and distribution of pre-engineered, trustless steel buildings. Ranging in size from 14 ft. To 40 ft widths with unlimited lengths, the ends of these versatile buildings can be easily customized to fit your homes decor. Highly versatile and perfect for any commercial industrial, farm, or consumer application. Each building is custom designed to your specification, and still accommodates your county wind and snow load. It will meet or exceed industry standards and regional requirements. Includes 16' Wide by 11' Tall Manufactured Opening. Can be customized as desired using your own materials. (Doors as illustrated not included). 22GA America's Finest Galvalume Plus Coated Steel (Seven times more rust resistant than Galvanized Steel)Unlike. 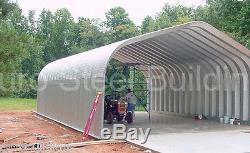 Other manufacturers, Duro Steel Buildings is committed to excellence and thus uses only the finest and heaviest. Gauge steel available, we refuse to use anything below 22GA. In order to keep you and. 138MPH Wind Load, 24 lb. Duro uses the HIGHEST CONTENT Galvalume available: as high (or higher) than any Arch Building Fabricator! Quick modular construction, units can be erected by a small crew with very little equipment! We carry insulation and accessories for all our buildings. Check out our store for more information. About Duro Steel - Important Additional Information. The name Duro Steel is recognized around the world to be a leader in prefabricated and Industrial Steel Buildings. Duro Steel Buildings is committed to excellence that's why its backed up by some of the highest standards, such as. Canadian Institute of Steel Construction. Professional Engineers Licensed in 50 States and Canada. Our factory has been manufacturing and distributing Steel Buildings for over 20 years! Our Offices are in the same Location since July of 1998. Duro Steel is proud to provide quality products with Customer Service Second to None! Duro Buildings is a trusted brand name and one of the largest Full Service Steel Building Providers on the Internet. See our about us page. PRICE MATCH GUARANTEE: If you find this item less expensive anywhere on the Internet, let us know and we will match or beat that price when Comparing Apples to Apples! SUPERIOR CUSTOMER SERVICE: We take pride in providing prompt and courteous customer service. The item "DuroSPAN Steel 30x70x14 Metal Garage Kit Building Shed Workshop Factory DiRECT" is in sale since Sunday, September 2, 2018. This item is in the category "Business & Industrial\Building Materials & Supplies\Modular & Pre-Fabricated Buildings". The seller is "durobuildings" and is located in Kalamazoo, Michigan. This item can be shipped to United States.